It’s coming up on February. As if you didn’t know by cruising around Pinterest these days! 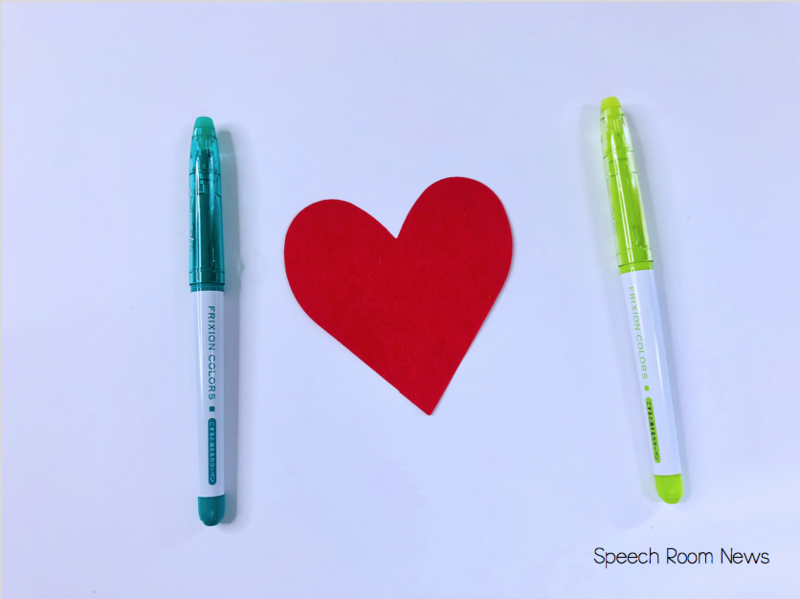 Here are a few things we’ve been doing in the Speech Room! I made these quick hearts to use with preschool – 2nd graders. They each have a positional concept on them . I passed them out to my kiddos and they demonstrate the concepts. They particularly enjoyed demonstrating ‘above’ Ms. Rayburn’s head 🙂 Lots of giggles. For my older kiddos, I added two step directions (ex: Place one heart on the corner of the iPad, and the other heart between 2 mirrors.) Grab it Here!! I printed several copies of this game. 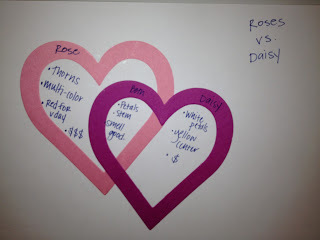 I let the kids pick either pink or red. Then I gave them a pack of articulation cards. 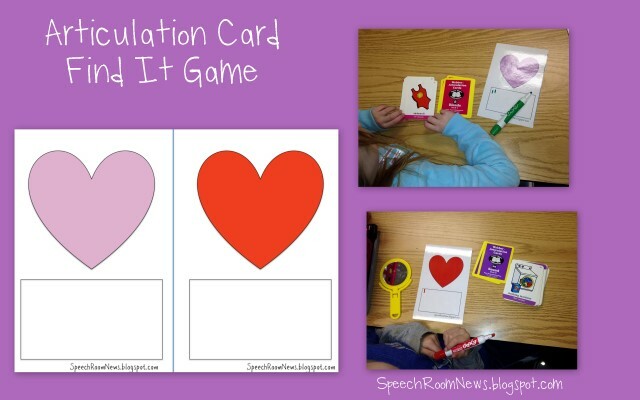 As the child flipped over each card they said their target and then looked for the color on their heart anywhere on the articulation card. If they find the color on their heart, they make a tally mark. Every articulation card (or language card!) they say, gives them a chance to find their color. The person with the most tally marks at the end was the winner. Two materials: Three activities. 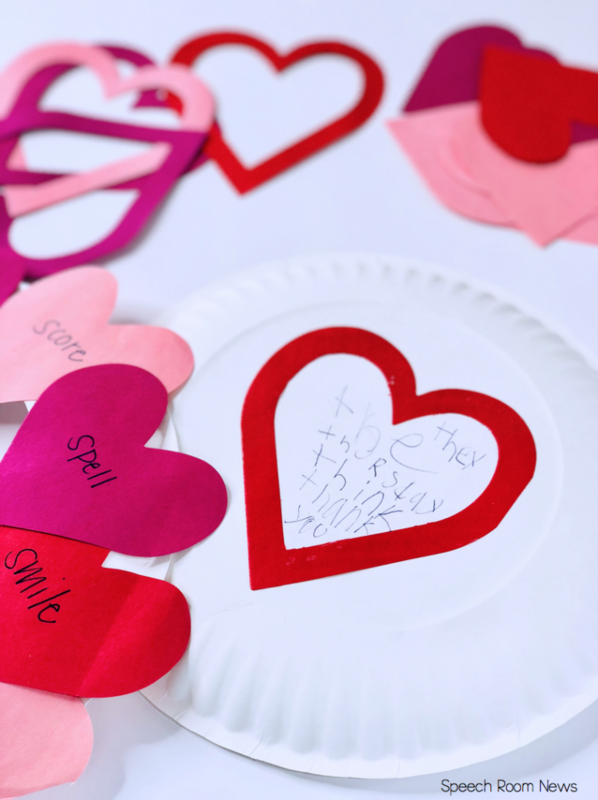 Grab a box of paper plates and some construction paper. 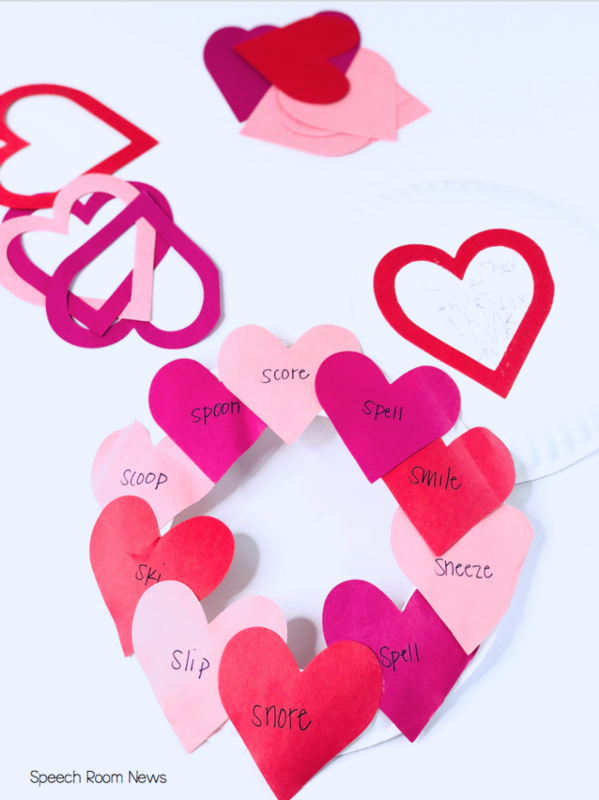 Cut out about a zillion hearts with the Ellison machine. You will get two parts of the heart (the inside and the outer part). I had my students write their articulation and language targets on the inner hearts. We used 10 each, and added them to the paper plate to create a simple wreath. The wreath above was an TH wreath I made for one of my examples. and Here’s one below for S-blends. This is a heart – venn diagram that a student and I made comparing and contrasting rose and daisy flowers. I asked on our Facebook page (if you aren’t a follower.. see the box on the right side!) what you wanted to see targeted for Valentine’s day. Well most of you asked for Figurative Language or middle/HS activities. I only work with kiddos up to 5th grade so I stuck with idioms. Above is an Idioms wreath that I made with my kiddos. 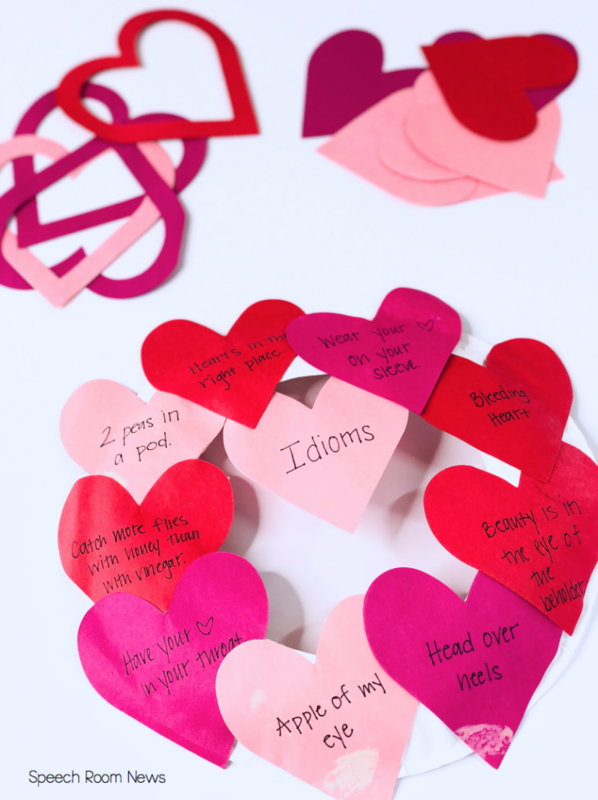 I picked several love/heart themed idioms to add to our wreath. My kids didn’t really know any of the idioms I tried to use, so I made them booklet for their reference. It took us a couple sessions to make these wreaths. 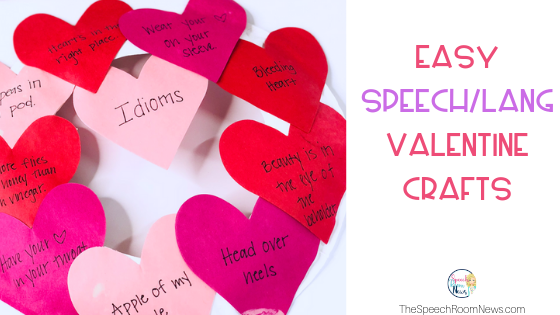 The kids copied the idioms to their hearts. Before they could add it to the wreath, they needed to explain it to me, without referencing the example book! The last activity that I created targets question generation. First I went to Dollar tree and grabbed some small foam hearts for a buck. Then on each heart, I added the answer the questions. (ex: ‘on Friday’, ‘ the nurse with red hair’, ‘ my uncle bob’) Just write answers that will have your kids generating all different types of WH/ DO and yes/no questions. Make sure your kids are using the little words correctly. For example if the card says ‘to Disney’ and ‘at Disney’ you will need different types of questions. The student reads the ‘answer’ heart and then develops an appropriate question. On the back write random numbers. If the student answers correctly – they earn that many points. (I used mostly 2’s with a few 0’s and a few 10’s.) My kids needed a visual cue card. I added the WH words and some notes on a white card as we went. You could make a visual with Boardmaker as well if they really needed it. Made sure you check out my Pinterest board and other other blogs on my blogroll. Tons of great ideas out there! I’ve been downloading lots of create ideas! All I can say is WOW, and Thank You! thank YOU for commenting 🙂 happy valentine’s day! Where do you print all your colored pages? My school doesn’t have a color printer and I want to print EVERYTHING from your site! It’s all so fabulous! I print at school. Luckily both of my schoosl have a color printer and its full of ink most days. I’m lucky. Last year… when we didn’t have a color printer for a while, I used my personal one. But I know the ink adds up! AMAZING!!!!! These are all fantastic! make sure to share at Thrifty Thursday this week! Also, if you make a blog button, I’d love to put in my sidebar. If you want help making one, I can give you the code to make one, just email me at Katie@playingwithwords365.com. haha. come on over. i bet we could get a lot done with TWO of us! We have to bring Katie too. She’s teaching me all kinds of bloggy things today! Thanks!! Love everything you do. Can I just say you are SO creative! I LOVE all your ideas and I’ve already used so many of them! And I want to know where you find all the time to make these 😉 Great job! What do you use to make some of these games? Thanks! I use powerpoint and word. Nothing fancy over here! And I dream up ideas during therapy usually. By what that kids like, say, etc. I have a post it note wall next to my desk. Other things like the v-day activities I just wing it. I had the idea for the wreath of some kind and just gathered materials and ‘winged’ it to make sure I was meeting all the goals I needed to:) I figure if I create activities while I watch reality TV, the good and bad cancel each other out 😉 Thanks for being a follower! Share it with your colleagues! My kiddos LOVED the Artic “Find It” game. They were asking “Can I try 8 cards this time?” They wanted more and more practice. Thanks a bunch! Guess WHAT Jenna!? Your post was NUMBER ONE AGAIN at Thrifty Thursday! Woo hoo!! Come check it out tomorrow evening when I post it! I just LOVE your blog! 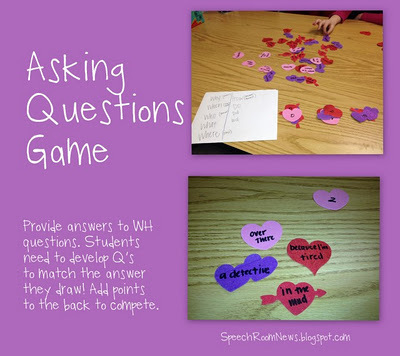 Such great ideas, and my kids love it! Thanks for posting your creative ideas! THANKS for all of your cool ideas and FREEBIES!! I’m constantly printing things that you are posting! Thank you for all the fabulous ideas! I wish I’d found you earlier but I still have time to gather supplies for V-day. Do you have a list of the idioms that go with your pictures? If you download the free book, all the idioms are in there. Have you updated your February Road Map? So many amazing activities I will be using! Now where to start! 🙂 Thank you!